Scratch-resistant, easy to install protection against marring surfaces such as countertops, end tables, etc. Stick to back of frames to protect walls. Scratch-resistant, easy to install protection against marring surfaces such as countertops, end tables, etc. 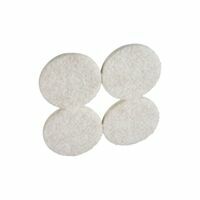 Includes (16) 3/8", (8) 1/2", (10) 5/8", and (12) 3/4" felt pads. Assorted sizes. Scratch-resistant, easy to install protection against marring surfaces such as countertops, end tables, etc. Includes (16) 3/8", (8) 1/2", (10) 5/8", and (12) 3/4" felt pads. Assorted sizes. Visual-pack. Visual-pack. Install in wooden legs to help smoothly move furniture over flooring. Plastic base. Install in wooden legs to help smoothly move furniture over flooring. Plastic base. Install in wooden legs to help smoothly move furniture over flooring. Plastic base. Visual-pack. Install in wooden legs to help smoothly move furniture over flooring. Plastic base. Easy to install protection for surfaces such as hardwood, linoleum, vinyl, terrazzo, marble, etc. Slides easily over surfaces without marring. Visual-pack. Visual-pack. Offers mobility to heavy loads on smooth, hard surfaces and finished concrete floors where quiet movement and floor protection are major considerations. Use on carpet, ceramic, concrete, or wood. 765.0518 has 1-1/2" x 1-3/4" plate size. 542.0864 has 1-7/8" x 2-9/16" plate size. 623.0015 has 2-3/4" x 3-7/8" plate size. 787.3813 has 3-1/8" x 4-1/8" plate size. 998.2935 has 4" x 5-1/8" plate size. 588.9928 has 2-7/8" x 3-5/8" plate size. Visual-pack. Scratch-resistant, easy to install protection against marring surfaces such as countertops, end tables, etc. Easy-to-install protection against marring surfaces such as hardwood, linoleum, vinyl, terrazzo, marble, etc. Rubber cushion on base to help level office and household furniture with threaded sockets. Stem: 1/4" - 20 x 1/2". Scratch-resistant, easy to install protection against marring surfaces such as countertops, end tables, etc. Easy to install protection for surfaces such as hardwood, linoleum, vinyl, terrazzo, marble, etc. Slides easily over surfaces without marring. Easy to install protection for surfaces such as hardwood, linoleum, vinyl, terrazzo, marble, etc. Slides easily over surfaces without marring. Allows furniture to move smoothly over floors. For installation in wooden legs. Not for use on chair legs. Offers mobility to heavy loads on smooth, hard surfaces and finished concrete floors where quiet movement and floor protection are major considerations. Use on carpet, ceramic, concrete, or wood. Offers mobility to heavy loads on smooth, hard surfaces and finished concrete floors where quiet movement and floor protection are major considerations. Use on carpet, ceramic, concrete, or wood. 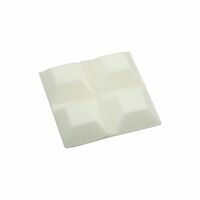 Rubber cushion on base to help level office and household furniture with threaded sockets. Stem: 1/4" - 20 x 1/2". Wheels are lightweight, non-marking, and impervious to water with good chemical resistance. Long wearing and low in cost. Scratch-resistant, easy to install protection against marring surfaces such as countertops, end tables, etc. Easy to install protection for surfaces such as hardwood, linoleum, vinyl, terrazzo, marble, etc. Slides easily over surfaces without marring. Use on chair and stool legs to provide floor protection. Easy to install protection for surfaces such as hardwood, linoleum, vinyl, terrazzo, marble, etc. Slides easily over surfaces without marring. Used to keep objects in position and resist movement. Reduces noise and vibration when applied on small appliances or machinery. With screws. Lightweight and non-marking wheels are impervious to water, long wearing, and have chemical resistance. Offers mobility to heavy loads on smooth, hard surfaces and finished concrete floors where quiet movement and floor protection are major considerations. Use on carpet, ceramic, concrete, or wood. 765.0518 has 1-1/2" x 1-3/4" plate size. 542.0864 has 1-7/8" x 2-9/16" plate size. 623.0015 has 2-3/4" x 3-7/8" plate size. 787.3813 has 3-1/8" x 4-1/8" plate size. 998.2935 has 4" x 5-1/8" plate size. 588.9928 has 2-7/8" x 3-5/8" plate size. Used for allowing heavy appliances and furniture to move smoothly on all non-abrasive floor surfaces like low pile carpet, vinyl, hardwood, etc. With screws. For wooden legs, taps in and will not split wood. Felt base protects hard surfaces and slides easily over floors that can be marred by most other glides. 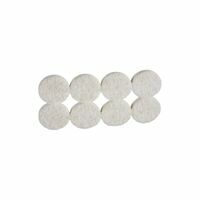 Round self-stick cork pads for protecting tables, walls, floors, etc. Easy-to-install protection against marring surfaces such as hardwood, linoleum, vinyl, asphalt tile, terrazzo, marble, etc. Self-stick cork pads for protecting tables, walls, floors, etc. Assorted shapes and sizes. 16 pieces per card. 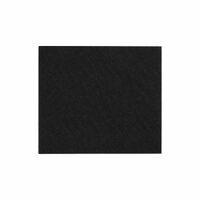 National Hardware Felt Pad, Series: V1716, 3/4 in, Black, For Use to Mute Sound, Protect Furniture and Counter Surfaces Easy-to-install protection against marring surfaces such as hardwood, linoleum, vinyl, asphalt tile, terrazzo, marble, etc. With four glides + 1" felt pad. Scratch-resistant, easy to install protection against marring surfaces such as countertops, end tables, etc. Use for heavy objects. Steel wheel. Zinc plate finish - UPC labeled. Ideal for tabletop items, audio video components and computer equipment. Protects surfaces from marring and scratching. For heavy objects. Black rubber wheel. Zinc plate finish - UPC labeled. Wheel thickness: 1-1/4". Visual-pack. Visual-pack. Nylon wheels assist in moving light to medium weight furniture. Used to protect hard floors from scratches and dents. Wheels have exceptionally long wear life. Can withstand temperature extremes. Used for allowing heavy appliances and furniture to move smoothly on all non-abrasive floor surfaces like low pile carpet, vinyl, hardwood, etc. 4 glides per package. Grips rugs and carpets to prevent movement. Use to secure tables, desks, footstools and other furniture. For heavy objects. Black rubber wheel. Used to protect hard floors from scratches and dents. 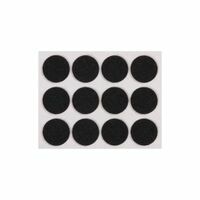 National Hardware Felt Pad, Series: V1716, 3-1/2 X 4 in, Black, For Use to Mute Sound, Protect Furniture and Counter Surfaces National Hardware Felt Pad, Series: V1717, Assorted, Black, For Use to Mute Sound, Protect Furniture and Counter Surfaces Used to move light to medium weight furniture with ease. Hard plastic wheels. Used to move light to medium weight furniture with ease. Hard plastic wheels. Used to move light to medium weight furniture with ease. Hard plastic wheels. Offers exceptionally long wear-life to withstand temperature extremes. Recommended for objects infrequently moved on rough wood and concrete floors. Use in acid, heat, or oil and on concrete. Used for allowing heavy appliances and furniture to move smoothly on all non-abrasive floor surfaces like low pile carpet, vinyl, hardwood, etc. 4 glides per package. Use on lightweight furniture, cribs, playpens, coffee and bedside tables. Rolls on carpeted and hardwood floors. Swivels on acetal resin bearings. Easy-to-install protection against marring surfaces such as hardwood, linoleum, vinyl, terrazzo, marble, etc. Use for heavy objects. Steel wheel. For wooden legs, taps in and will not split wood. Felt base protects hard surfaces and slides easily over floors that can be marred by most other glides. With hollow nails. Used for allowing heavy appliances and furniture to move smoothly on all non-abrasive floor surfaces like low pile carpet, vinyl, hardwood, etc. With screws. Nylon wheels assist in moving light to medium weight furniture. Used to move light to medium weight furniture with ease. Hard plastic wheels. Use to move light to medium weight furniture. Hard plastic wheels. Use to move light to medium weight furniture. Hard plastic wheels. Reduces friction between your large furniture or appliances allowing easy, smooth movement on non-abrasive floor surfaces like low pile carpet. Screws included. Used for allowing heavy appliances and furniture to move smoothly on all non-abrasive floor surfaces like low pile carpet, vinyl, hardwood, etc. With screws. 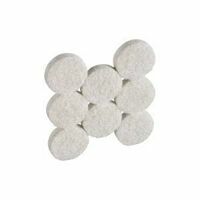 Use on lightweight furniture, cribs, playpens, coffee and bedside tables. Plastic wheels roll on carpeted and hardwood floors. Swivels on acetal resin bearings. 60 Lb. load cap caster features 3/8" x 1-1/2" stem. Offers mobility to heavy loads on smooth, hard surfaces and finished concrete floors where quiet movement and floor protection are major considerations. Use on carpet, ceramic, concrete, or wood. 355.0548 has 1-7/8" x 2-9/16" plate size. 094.8281 has 2-3/4" x 3-7/8" plate size. 545.9524 has 3-1/8" x 4-1/8" plate size. 796.7292 has 4" x 5-1/8" plate size. Reduces friction between your large furniture or appliances allowing easy, smooth movement on non-abrasive floor surfaces like low pile carpet. Used to move chairs, stools, folding chairs, tables and more. Moves up to 1600 pounds across vinyl, ceramic tiles, wood floors and carpeting. Will not scratch floors. Grip Tips stretch to grip a range of popular leg diameters. No adhesive or tools required. Open and stretch top of grip tip and secure on leg. Adjust tip all around to make even. Reduces friction between your large furniture or appliances allowing easy, smooth movement on non-abrasive floor surfaces like low pile carpet. Screws included. Reduces friction between your large furniture or appliances allowing easy, smooth movement on non-abrasive floor surfaces like low pile carpet. Use on RTA furniture, office chairs, printer stands, entertainment centers, etc. Twin wheels offer more wheel surface on carpet pile and move in opposite directions to minimize carpet fiber twisting. Used for allowing heavy appliances and furniture to move smoothly on all non-abrasive floor surfaces like low pile carpet, vinyl, hardwood, etc. Black rubber wheel with on and off break. Use for heavy objects. 675.9260 has 1-7/8" x 2-19/32" plate size. 926.0688 has 2-3/4" x 3-7/8" plate size. 888.4264 has 3-7/64" x 4-1/8" plate size. 675.9278 has 4" x 5-7/64" plate size. Offers mobility to heavy loads on smooth, hard surfaces and finished concrete floors where quiet movement and floor protection are major considerations. Use on carpet, ceramic, concrete, or wood. Stem: 1-3/8"H and 7/16"Dia. Use on RTA furniture, office chairs, printer stands, entertainment centers, etc. Twin wheels offer more wheel surface on carpet pile and move in opposite directions to minimize carpet fiber twisting. Treaded casters for hard surface floors. Used to move light to medium weight furniture with ease. Hard plastic wheels. Used to move light to medium weight furniture with ease. Hard plastic wheels. Nylon wheels assist in moving light to medium weight furniture. Offers mobility to heavy loads on smooth, hard surfaces and finished concrete floors where quiet movement and floor protection are major considerations. Use on carpet, ceramic, concrete, or wood. Help level office and household furniture with threaded sockets. Stem: 5/16-18" x 1-1/2" Used for allowing heavy appliances and furniture to move smoothly on all non-abrasive floor surfaces like low pile carpet, vinyl, hardwood, etc. With screws. Use on lightweight furniture, cribs, playpens, coffee and bedside tables. Rolls on carpeted and hardwood floors. Swivels on acetal resin bearings. Use on lightweight furniture, cribs, playpens, coffee and bedside tables. Plastic wheels roll on carpeted and hardwood floors. Swivels on acetal resin bearings. 60 Lb. load cap caster features 3/8" x 1-1/2" stem. Use on RTA furniture, office chairs, printer stands, entertainment centers, etc. Twin wheels offer more wheel surface on carpet pile and move in opposite directions to minimize carpet fiber twisting. Treaded casters for hard surface floors. 1-1/2" square plate. Soft rubber wheels give mobility to heavy loads on smooth hard surface and finished concrete floors where quiet movement and floor protection are major considerations. 9194 Stem: 1-1/2"H, 3/8" Diam., and 16 TPI. 9196 Stem: 1-1/2"H, 1/2" Dia., and 13 TPI. Made with premium quality felt backed by durable foam for repeated use on hard surface floors. Use, then remove and store until needed again. Protection for surfaces such as hardwood, linoleum, vinyl, asphalt tile, terrazzo, marble, etc. Removes friction between furniture and carpeting. Moves heavy objects with ease and avoids excessive effort or damage. For heavy objects. Black rubber wheel. Use to move light to medium weight furniture. Hard plastic wheels. Use to move light to medium weight furniture. Hard plastic wheels. Used to move light to medium weight furniture with ease. Hard plastic wheels. Nylon wheels assist in moving light to medium weight furniture. Black. Nylon wheels assist in moving light to medium weight furniture. Use to move light to medium weight furniture. Hard plastic wheels. Use to move light to medium weight furniture. Black rubber wheel. Nylon wheels assist in moving light to medium weight furniture. Nylon wheels assist in moving light to medium weight furniture. Used to move light to medium weight furniture with ease. Hard plastic wheels. Use to move light to medium weight furniture. Black rubber wheel. Nylon wheels assist in moving light to medium weight furniture. Nylon wheels assist in moving light to medium weight furniture. Used to move appliances and footed furniture such as sofas, refrigerators, beds, tables, dressers, washers, dryers and stoves. Moves up to 2500 pounds across vinyl, ceramic tiles, wood floors and carpeting. Will not scratch floors. Used to move chairs, stools, folding chairs, tables and more. Moves up to 1600 pounds across vinyl, ceramic tiles, wood floors and carpeting. Will not scratch floors. Grip Tips stretch to grip a range of popular leg diameters. No adhesive or tools required. Open and stretch top of grip tip and secure on leg. Adjust tip all around to make even. Reduces friction between your large furniture or appliances allowing easy, smooth movement on non-abrasive floor surfaces like low pile carpet. Used to protect hard floors from scratches and dents. Light wood grain. Reduces friction between your large furniture or appliances allowing easy, smooth movement on non-abrasive floor surfaces like low pile carpet. For wood or metal bed frames. Provides easy movement and max floor protection by distributing weight over a larger area. White. Offers mobility to heavy loads on smooth, hard surfaces and finished concrete floors where quiet movement and floor protection are major considerations. Use on carpet, ceramic, concrete, or wood. 765.0518 has 1-1/2" x 1-3/4" plate size. 542.0864 has 1-7/8" x 2-9/16" plate size. 623.0015 has 2-3/4" x 3-7/8" plate size. 787.3813 has 3-1/8" x 4-1/8" plate size. 998.2935 has 4" x 5-1/8" plate size. 588.9928 has 2-7/8" x 3-5/8" plate size. For heavy objects. Black rubber wheel. Zinc plate finish - UPC labeled. Wheel thickness: 1-1/4". Reduces friction between your large furniture or appliances allowing easy, smooth movement on non-abrasive floor surfaces like low pile carpet. Use on RTA furniture, office chairs, printer stands, entertainment centers, etc. Twin wheels offer more wheel surface on carpet pile and move in opposite directions to minimize carpet fiber twisting. Treaded casters for hard surface floors. 1-1/2" square plate. Use on RTA furniture, office chairs, printer stands, entertainment centers, etc. Twin wheels offer more wheel surface on carpet pile and move in opposite directions to minimize carpet fiber twisting. Treaded casters for hard surface floors. Used to protect hard floors from scratches and dents. Light wood grain. Lightweight and non-marking wheels are impervious to water, long wearing, and have chemical resistance. Wheels have exceptionally long wear life. Can withstand temperature extremes. National Hardware Felt Pad, Series: V1719, 1-3/4 in, Neutral, For Use to Mute Sound, Protect Furniture and Counter Surfaces Use to move light to medium weight furniture. Black rubber wheel. Use to move light to medium weight furniture. Black, polypropylene resin wheel. Bright brass finish. Use to move light to medium weight furniture. Black, polypropylene resin wheel. Bright brass finish. Use to move light to medium weight furniture. Black rubber wheel. Use to move light to medium weight furniture. Black, polypropylene resin wheel. Bright brass finish.